NetREPORT forever changed the fire protection inspection industry with the introduction of its comprehensive inspection automation system, powered by InspectionLogic. Utilizing the latest in handheld computers combined with NetREPORT’s state-of-the-art internet based Inspection, Testing and Maintenance software, this innovative technology adds value to ORR’s service by combining three powerful elements; paperless data collection during inspections, secure SQL server database, and web-based document management. Is your fire inspection provider behind the times? Do you know the answer to these 5 questions? Do you have a high level of confidence in the accuracy of your inspection reports? Accuracy? Are you confident that each and every inspection is compliant with all local, state and national fire codes? Code Compliance? Do you really know your fire protection systems are actually being inspected and tested? Inspection Accountability? Do you receive all your Inspection Reports in a standard, easy to read format? Standard Reporting Format? Do you have easy and instant access to all your inspection reports, invoicing, as-built drawings, and other system documents from anywhere? Report and Document Management? 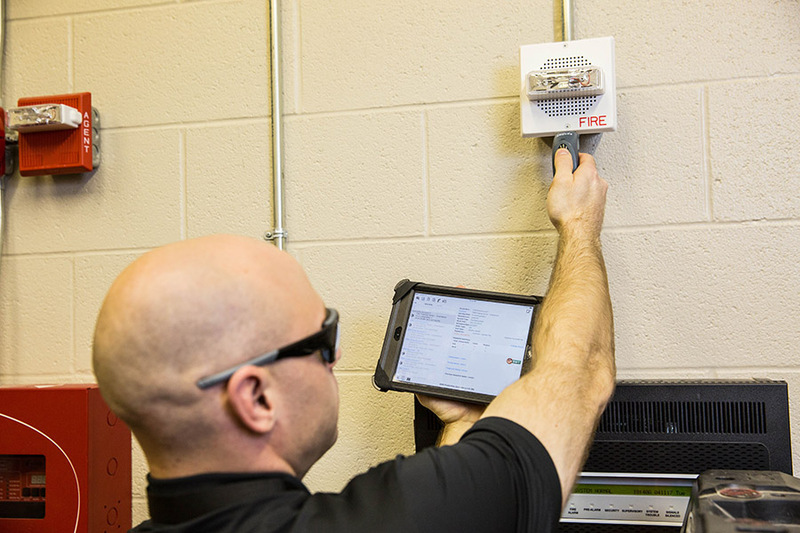 Combining the latest in handheld computers, with the most intelligent software systems ever developed for Inspection, Testing and Maintenance, NetREPORT provides you with the confidence that your fire protection system has been inspected and maintained meeting all local, state and national fire codes. Once ORR’s fire protection system bar code has been scanned, NetREPORT’s customized software takes the ORR field technician through systematic detailed inspection instructions. This insures that a thorough and accurate inspection is completed. It also maintains a current inventory of your components. Code ComplianceThrough NetREPORT’s software, the field technician is presented with inspection instructions that meet all local, state and national fire codes. The software also incorporates ORR’s own ISO 9001:2015 compliant Quality Management System work instructions and operating procedures. Inspection AccountabilityUnfortunately, not all fire protection service providers have been consistent when performing and documenting inspections. When ORR uses the NetREPORT barcode system, a time & date stamp is automatically generated when each component is scanned. All tasks must be completed, and all failures logged. Included are the reasons why the component failed and what actions were, or need to be, taken. All of this information appears in your service report. Standard Reporting FormatAfter each inspection is reviewed by a supervisor, a readable, computer generated standardized report is created for each system inspected or serviced. You will no longer have to deal with hard to read handwritten reports, in multiple formats that can be confusing to interpret. Reports and Document ManagementEach technician’s inspection results are uploaded from the handheld computer to ORR’s integrated information management system. After a Quality check, your service report is instantly accessible online to you and/or your organization using ORR’s secure NetSITE web-portal.